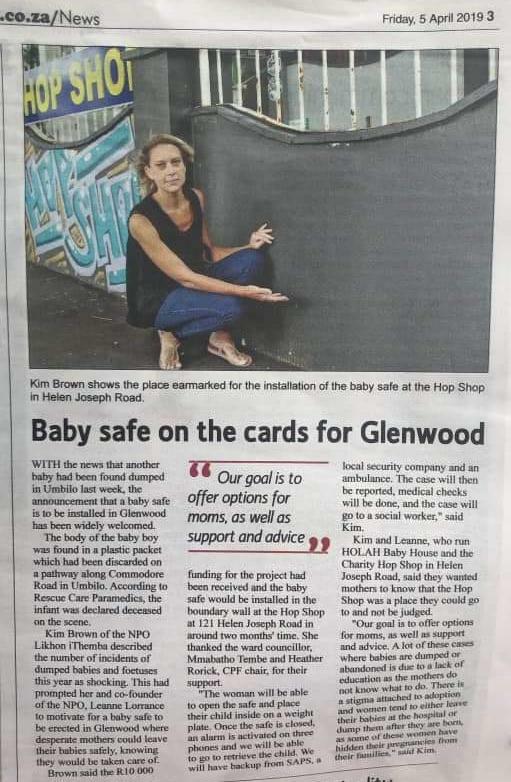 We have seen an alarmingly high rate of baby abandonments in the Glenwood/Umbilo area and, each time a new case arises, we are stirred to make a change. Our mission is to create a platform that will give moms or soon-to-be mothers the space to speak up and seek counseling. Our primary goal in each case is to assist the moms in keeping their child and not feeling that their only option is to abandon their child. Should a mother feel that abandoning her child is the only option, we have put in a baby safe for a mother to do so safely. It is our duty to promote the safety of each child, regardless of the circumstances. Once a baby is placed in the baby safe, an alarm will be sent to those that are linked to it, including an ambulance, a social worker, and a few individuals that are responsible for the baby safe. Although this seems like a simple process, education is the key factor – educating mothers that they are never alone, walking the journey with them and should they feel that they still have no other option, educating them on safe abandonment. We need to eliminate the deaths that are caused from abandonment. We need to eliminate mothers feeling as though they are alone. We need to break the cycle of uneducated moms not knowing how to deal with these situations and we believe that, through this, we will be planting seeds in the right minds and giving moms the correct tools to walk this journey of motherhood.